Jesús A. Morales Matos was born into a prominent musical family and is an active soloist, recording artist, and chamber musician. 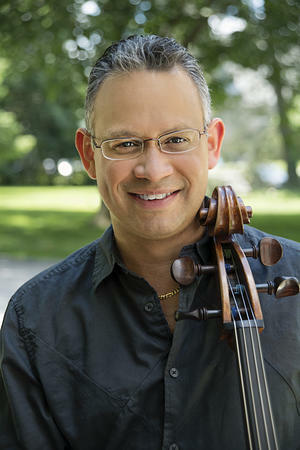 He currently serves as cello professor with ArCoNet and Temple University, and has an active private studio. As a member of the Dalí Quartet, Jesus is on faculty at West Chester University as part of the quartet's residency. His students have been accepted into esteemed music schools such as the Curtis Institute of Music, Yale University, and Temple University. Mr. Morales solo appearances include the Philharmonia Bulgarica, the San Bernardino Symphony, New Mexico Symphony Orchestra, the Orquesta Sinfonica de Puerto Rico, the Camerata Symphony, the National Repertory Orchestra, the Starling Chamber Orchestra, and the Festival de Orquestas Sinfonica Juvenil de las Americas. As a recording artist, Mr. Morales’ recordings of the Saint-Saëns and Lalo cello concertos on the Centaur label, were received with rave reviews. Mr. Morales has participated in summer festivals including, the Casals Festival in Puerto Rico, Banff Centre for the Arts, Grand Teton Music Festival, Kneisel Hall Chamber Music Festival, Bowdoin Music Festival, Eastern Music Festival, and Música Rondeña in Albuquerque, New Mexico. Mr. Morales has also performed in recitals and chamber music concerts in Canada, Mexico, Venezuela, and St. Thomas, VI. Mr. Morales holds a bachelor’s degree from The Cleveland Institute of Music and has done postgraduate work at The Cincinnati College Conservatory of Music. His teachers include Dr. Ronald Crutcher, Alan Harris, Helga Winold, and Yehuda Hanani. He studied chamber music with Peter Oundjian among others. Mr. Morales resides in Philadelphia with his wife, violinist Dara Morales, and daughters Isabel and Karina.